Thornhill Ontario’s Envision Robotics provides quality robotics learning and STEM-based learning programs. Operated by John MacKinnon, Envision Robotics proudly provides robotics learning programs to Thornhill and surround Toronto Ontario areas. Blue Tide worked with John to create a WordPress website design that was able to display the breadth of programs available. Using vibrant colours and visual design elements, the Envision Robotics WordPress website provides a search engine optimized experience allowing online searchers to find, visit and engage with the Envision Robotics website. 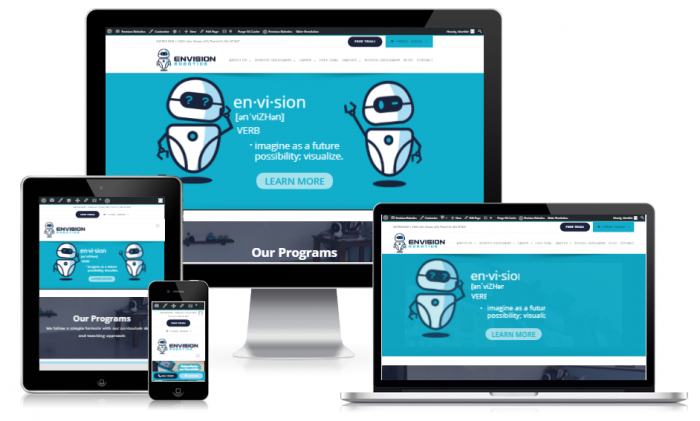 Considering a new website or website redesign in Thornhill Ontario or for your learning or STEM-based teaching service? Give us a call to discuss website design options, class-scheduling, virtual-teaching and local SEO for sales. We also provide free Google marketing advice to help clients get the most out of their online investments.